Martin Black’s G.L. Watson – The Art and Science of Yacht Design features today at Gavin Atkin’s excellent in the boatshed blog, which has rapidly become essential daily reading, and U.K. trad-boat central. Order by 10:00 (GMT) Monday 16th December for European Christmas delivery! This entry was posted in G.L. 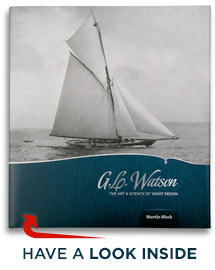 Watson, gift, leather-bound, limited edition, Martin Black, naval architect, object of desire, River Clyde, RNLI, shipbuilding, tank testing, Uncategorized, yacht design, yacht designer, yachting history and tagged giftabook, yachting history book. Bookmark the permalink.